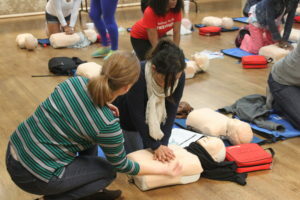 Free CPR Training Classes | The Junior League of Houston, Inc. The Healthcare Providers course – According to the American Heart Association, the appropriate audience for this course is healthcare providers such as EMS personnel, physician assistants, doctors, dentists, nurses and respiratory therapists. The Healthcare Providers course is comprised of educational material such as adult and pediatric CPR (including two-rescuer scenarios and use of the bag mask), foreign-body airway obstruction and automated external defibrillation. This course includes both a written exam and a skills exam that participants must pass in order to become CPR certified in Basic Life Support (BLS) for Healthcare Providers. The Heartsaver course – This course is for those who have a duty to respond to a cardiac emergency because of job responsibilities, regulatory requirements or personal desire. The Heartsaver course teaches CPR, AED use, relief of choking in adults and children, infant CPR and relief of choking, and the use of barrier devices for all ages. At the conclusion of the course, a skills test is administered to each student and must be passed in order to become CPR certified in Heartsaver AED. The League does not teach first aid. The class is free and in English only. All participants must bring and show a photo ID to class. Please, no children are allowed in the classroom. Class will begin promptly at the posted times; once the video has started, participants are not able to enter the classroom and will need to reschedule. Students who are sick or not feeling well are not able to work on or with the manikins and should re-schedule if any health issues apply. If you have questions about CPR Training Classes, please call The Junior League of Houston, Inc.’s CPR Information Line at 713.961.1670 or email cpr@jlh.org. To register for a CPR class, please click here. Registration for classes opens 30 days before the class date.